When the picture on the left snapped on a sunny day in 1900, the neighborhood now called LaRez was one of the city's showplaces. 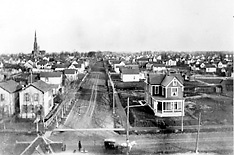 This view looking east along Tabor Street from the top of the Reservoir Park hill shows a neighborhood of trim new homes, buggy-tracked dirt streets and freshly planted trees. In the background, then as now, loomed the graceful spire of Zion Lutheran Church, built in 1890. But as the picture right suggests, time has not been kind to the neighborhood. The homes standing on either side of Tabor Street in the earlier photograph have long since given way to vacant lots. Trees which were not much more than seedlings at the turn of the century now obscure the view. (Editor's note, 1997: And the resurrection happened, and the neighborhood as a result developed one of the city's strongest neighborhood associations.